Composites the Foreground over the Background while defocusing both layers by different amounts. The Foreground alpha channel is used as the matte. If the Middle input is provided, it is composited between the Foreground and Background. Foreground: The current track. The clip to use as foreground, and the alpha channel of this clip is used as the matte. Defocus Foreground: Default: 0.1, Range: 0 or greater. 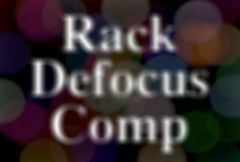 Defocus Background: Default: 0, Range: 0 or greater. Determines how the Foreground input channels are used to make a monochrome matte.